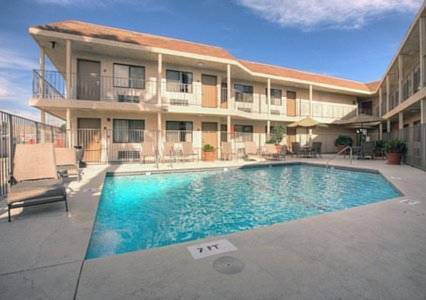 A good night and a great savings await you at the Rodeway Inn Magic Mountain Area hotel in Castaic, CA near Castaic Lake which offers trout fishing, boat rentals and seven miles of equestrian and hiking trails. Our hotel is close to attractions like Six Flags Magic Mountain, Six Flags Hurricane Harbor, Valencia Industrial Center and Valencia Commerce Center. Enjoy our amenities like free breakfast, free WiFi, free coffee, an outdoor heated pool, meeting space and guest laundry services. Our fresh, clean rooms offer TVs, hair dryers, coffee makers, irons and ironing boards. Also, earn rewards including free nights and gift cards with our Choice Privileges Rewards program. Pet Accommodation: 30.00 Per Night and Per Pets. Non-smoking rooms available. - Placerita Canyon Nature Ctr. Above the entrance to the CVS Pharmacy is a sight that will persuade you to get back on your meds.